What does a hand polishing worker do? Would you make a good hand polishing worker? Take our career test to find out how you match with this and over 800 other careers. What is a Hand Polishing Worker? What is the workplace of a Hand Polishing Worker like? A hand polishing worker, or hand grinding worker, is someone who is responsible for grinding, sanding, and/or polishing objects to a smooth finish. 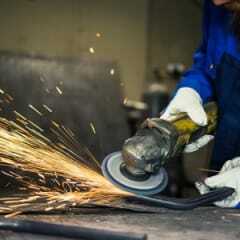 The objects that a polisher may work with can be made from metal, wood, stone, clay, marble, plastic, and glass. The objects worked on can be smaller craft items delivered directly to a market, such as jewelry, or be larger items such as furniture or metal parts in a factory. A hand polishing worker must be able to use a variety of tools, both large and small, to shape the object in question to the desired shape and desired surface. The finished pieces may require excruciatingly exact detail, and the worker must have the skill to be able to derive the perfect finish from the modified objects. On a daily basis, the hand polishing worker or grinder must ensure that the equipment they work with is up to par and in good operating condition. The polisher must prepare, sharpen, and test his or her equipment at the beginning of the day, adjust the power and speed of tools used during the day based on the required finish, and shut down and clean up his or her station at the end of the day. These objects can be manual chisels or scrapers or mechanical saw, sanders, or grinders. Throughout the day, the polisher will work on various objects. In addition, he or she will also inspect each item for cracks or repairs, and mark them for any additional work that is needed. For larger products, they may need to inspect blueprints or add records and notes for specific items. On most items, they may also need to add chemicals to apply a finish to the product being ground or polished. Are you suited to be a hand polishing worker? Hand polishing workers have distinct personalities. They tend to be realistic individuals, which means they’re independent, stable, persistent, genuine, practical, and thrifty. They like tasks that are tactile, physical, athletic, or mechanical. Some of them are also conventional, meaning they’re conscientious and conservative. Does this sound like you? Take our free career test to find out if becoming a hand polishing worker is right for you. In most cases, the workplace of a hand polishing worker is an industrial or manufacturing environment. There will be spaces for the polishing equipment and other tools, and the overall size of the work environment will depend on the number of workers employed. The working area may be a union environment that is only operating during specific business hours. In these cases, the working area may be somewhat larger in order to allow multiple workers to perform their jobs in one area.